Last weekend we went to a wedding for our niece. Almost the whole family went, which meant that we had to pack up two cars to fit everybody. We left early in the morning from our house, since we had to travel about 6 hours. That meant everyone one had to be at our house early and I knew that they would be looking for something for breakfast. 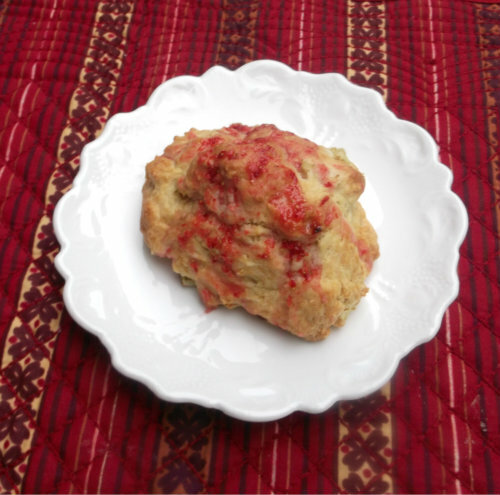 Since we have an abundance supply of rhubarb and if you read my blog at all you will know that I love making scones. 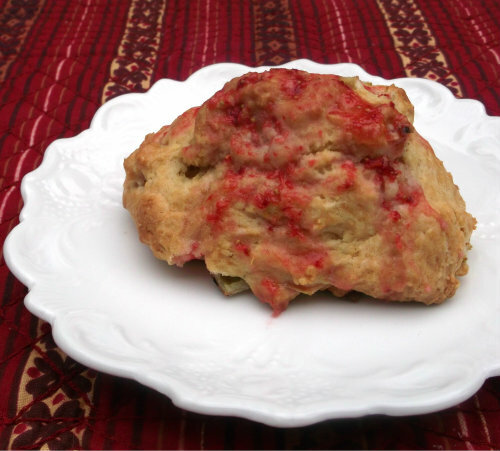 I decided to make some rhubarb scones the week before the event and freeze them. This way I could take them out of the freezer the night before and we would have quick and easy breakfast. I found a recipe that I thought would work well and decided to add a strawberry glaze to add a little more flavor. Plus the fact the rhubarb and strawberries pair so very well together. I would suggest that if you decided to make these scones that you and add the glaze that you don’t put the glaze on until you are ready to serve them. I think it would work better than putting the in advance. Everyone enjoyed the scones. We all had a wonderful time at the wedding and we made it home safe and sound. My father-in-law is spending sometime with us, so next week I will be taking sometime off from posting recipes. I am planning on enjoying his company while he is visiting. I may pop in to visit some of your blogs if I find some time. In a bowl combine flour, sugar, baking powder, and baking soda. Add butter and cut in with a fork until mixture resembles a coarse meal. Mix in the rhubarb, egg, and buttermilk until just combined. Using two spoons or an ice cream scoop, scoop out generous pieces of the dough and placed on a greased baking sheet, spacing about 1 inch apart. You should have 13 to 14 scones. Bake scones for about 25 to 30 minutes, or until a light golden brown. Allow to cool slightly on a cooling rack. Add all ingredients together and beat until smooth. Drizzle over scones and serve. Great looking scones! I love rhubarb any which way, and I’ve never had it in scones before. Gotta try it! Have a great week off! What a great idea! They look fantastic. 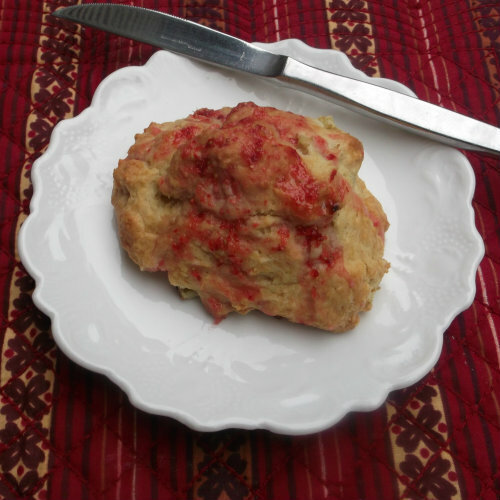 I never had rhubarb scone…looks great Dawn.